I relived some of the best moments from my childhood over the last two weeks as I shared the all-time greatest book ever with my boys. As a young girl, I spent a good deal of time dreaming of horses. And much of the blame for that can be laid at the feet of Mr. Walter Farley, author of The Black Stallion . I remember the day my mom came home from the library and put that book in my hands. It honestly was a life-changing moment. I was in fourth grade at the time, and not yet an avid reader. But by the shipwreck in chapter two, Mr. Farley had me, hook, line and sinker. I was dragged through the sea to the deserted island along with Alec and the Black. I scavenged for food. I tamed the stallion. I rode for hours at the edge of the sea. I was there pleading along with Alec when his rescuers were going to refuse passage for the Black. I was on pins and needles during the long months Alec and his trainer Henry waited for word of the Black’s lineage so they could provide the papers necessary to race him. And I cheered myself hoarse when the Black finally tore up the track. Over the next year, I read every single Black Stallion book our library carried—not every one that was written, but nearly. I even saved up my allowance to buy some of the ones I couldn’t borrow. I entertained the notion of being a jockey long past the age of reason. Even in junior high and high school, after my family moved to the country and purchased a horse, I would pretend I was in silks and Rusty was a long-legged Thoroughbred. I was thrilled that he was, in fact, part Arabian, just like the Black. And to this day, I still watch the Big Three horse races every summer. This week with my boys, I was back in fourth grade recapturing that magic. The writing wasn’t quite as perfect as I remember, but in my opinion, it’s still the greatest book in the world, because not a single one since has ever captured me as completely as the Black. We finished reading a few days ahead of schedule because my boys never wanted to quit reading after only two chapters, and several times they were able to persuade me to put off math and read another. Tonight we watched the movie, and as I put my youngest in bed, he was still celebrating the closing moments. I hope tonight in his dreams my little guy, too, gets to ride a very special big, black horse. Fourth or fifth grade reading level, read-aloud 6+. My mom said she really liked the Black Stallion(she read it when she was a kid)! I think I should read it. It’s cool you share books with your kids 😉 Great review! Yeah, this book is pretty special, and sharing with my boys makes it more so. Even after seventy years, it still reads like something that was written last year. Definitely give it a look. It’s an all boy adventure, but it appeals to girls too. Love it! Terrific reminder of a book I read long ago. Now, I’ll have to reread it. Thanks. 🙂 It’s like going back in time. A walk down memory lane. This was one of my very favorite books. I loved horse books, movies — still do. But, this is a classic. Enjoyed your review and comments about how after 70 years itstill reads as if was written last year! It is so timeless and it’s great kids today can enjoye this classic. Beautiful choice. I second your timeless comment. It’s amazing to me how one great book has the power to touch so many, many lives. And keeps touching them! Popped over here from Shannon Messenger’s blog, mostly because I saw you were sharing The Black Stallion love. 🙂 It’s also one of my favorite books ever, and I also devoured the series in 4th and 5th grade. It didn’t help that I live super close to Santa Anita Park, where the match race in the movie was shot. So glad to have found another Black Stallion fan, and that’s awesome that your boys enjoyed it too! Ah, I love Shannon’s MMGM. Thanks for stopping by. It’s great to meet another Black fan! How cool that you lived close to the track! I absolutely would have been begging to go there all the time. Last week I thought the movie moved a little slow compared to today’s films, but I remember being awestruck to see the book come to life when I was nine. This was one of my favorites as a kid. I dreamed of owning a horse and re-read and re-read this book as I dreamed. I’m curious to hear what any of you Black fans thought of the Island Stallion, also by Farley. Ever read that one? I remember being disappointed when I saw it was a different boy and different horse, but I ended up liking it just as much, just in a different way (kind of like adding a second kid, lol). It was hardly fair when the two met! I didn’t know who to cheer for! Gosh, now I’d like to read Island Stallion again. Ahh! I forgot to grant the Squeaky Award to the most worthy book of all! 🙂 There, done. I loved that book! I read it in the 3rd grade! 😀 Thank you for sharing this with me Mrs. Michelle! Oh wow–the Black looks awesome on the cover! 🙂 Have you ever read ‘Swiss Family Robenson’. Or ‘Robinson Crusoe’? No horses in them, but great books! Yes, and yes! And I liked them both! 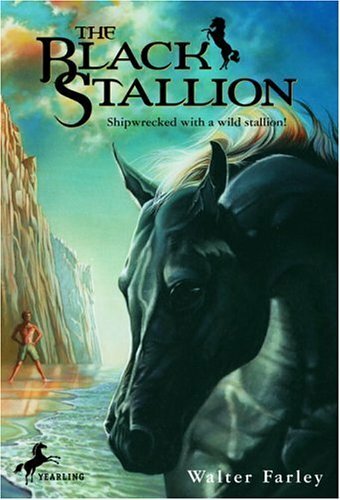 I, too, read and re-read every single Black Stallion book. And the Island Stallion: awesomest island ever! (And the wonderful tension of Flame vs the Black: talk about a love triangle!) But I never got to move to the country and have a horse. Jealous! Thanks for stopping by, Kim. It was fun having a horse, but it wasn’t for long. Once I went away to college, my parents sold him. 😦 He went to some young kids getting involved in 4H, but I often wondered what happened to Rusty.